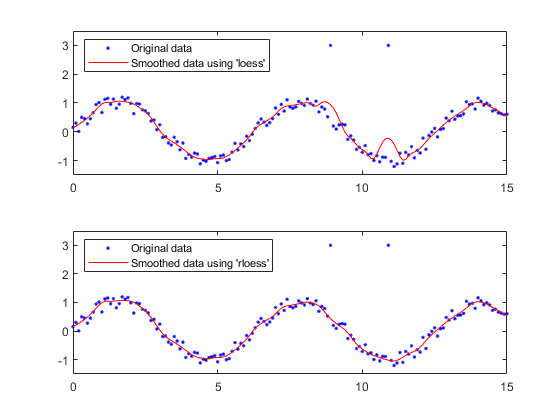 yy = smooth(y) smooths the response data in column vector y using a moving average filter. The first few elements of yy follow. 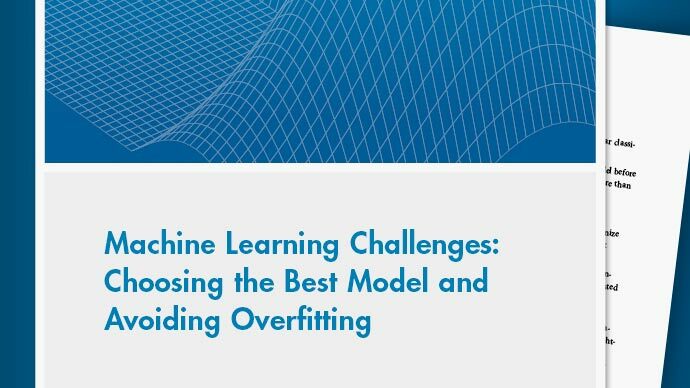 Because of the way smooth handles endpoints, the result differs from the result returned by the filter function. yy = smooth(y,span) sets the span of the moving average to span. yy = smooth(y,method) smooths the data in y using the method specified by method and the default span. yy = smooth(y,span,method) sets the span of method to span. yy = smooth(y,'sgolay',degree) uses the Savitzky-Golay method with the polynomial degree specified by degree. yy = smooth(y,span,'sgolay',degree) uses the number of data points specified by span in the Savitzky-Golay calculation. span must be odd and degree must be less than span. yy = smooth(x,y,___) specifies values for the independent variable x. You can use this syntax with any of the arguments in the previous syntaxes. gpuarrayYY = smooth(gpuarrayY,___) performs the operation on a GPU using gpuArray data. You can use gpuArray response data with all previous syntaxes. This syntax requires Parallel Computing Toolbox™. gpuarrayYY = smooth(gpuarrayX,gpuarrayY,___) performs the operation on a GPU using gpuArray input data. This syntax requires Parallel Computing Toolbox. Using gpuArray x and y inputs with the smooth function is only recommended if you use the default method, 'moving'. Using GPU data with other methods does not offer any performance advantage. Smooth data by linear index and by each column separately, using a moving average filter. Plot and compare the results. Load the data in count.dat. The 24-by-3 array count contains traffic counts at three intersections for each hour of the day. Suppose that the data are from a single intersection over three consecutive days. Smoothing all the data togther would then indicate the overall cycle of traffic flow through the intersection. Use a moving average filter with a 5-hour span to smooth all the data simultaneously (by linear index). However, the data are in fact from three different intersections. Thus, smoothing columnwise gives a more meaningful picture of the traffic through each intersection in a day. Use the same moving average filter to smooth each column of the data separately. Plot the original data and the data smoothed by linear index and by each column separately. Then, plot the difference between the two smoothed data sets. The two methods give different results near the endpoints. Plot and compare the results of data smoothed using the loess and rloess methods. Then determine which method is less sensitive to outliers. Create noisy data with two outliers. Smooth the data with the loess and rloess methods. Use a span of 10% of the total number of data points. Plot the original and smoothed data. The outliers have less influence with the robust method rloess. Data to smooth, specified as a column vector. If your data contains NaNs and you do not specify x, your data is treated as nonuniform and the smoothing method 'lowess' is used. Number of data points for calculating the smoothed value, specified as an integer or as a scalar value in the range (0,1) denoting a fraction of the total number of data points. If you use the moving average or Savitzky-Golay methods, the number of data points for calculating the smoothed value must be an odd integer. If you specify span as an even number or as a fraction that results in an even number of data points, span is automatically reduced by 1. Smoothing method to smooth the response data, specified as one of the following methods. Moving average. A lowpass filter with filter coefficients equal to the reciprocal of the span. Local regression using weighted linear least squares and a 1st degree polynomial model. Local regression using weighted linear least squares and a 2nd degree polynomial model. Savitzky-Golay filter. A generalized moving average with filter coefficients determined by an unweighted linear least-squares regression and a polynomial model of specified degree (default is 2). The method can accept nonuniform predictor data. A robust version of 'lowess' that assigns lower weight to outliers in the regression. The method assigns zero weight to data outside six mean absolute deviations. A robust version of 'loess' that assigns lower weight to outliers in the regression. The method assigns zero weight to data outside six mean absolute deviations. Polynomial degree for the model used in the Savitzky-Golay method, specified as a scalar value. degree must be less than span. Independent variable for the response data y, specified as a column vector. If you do not provide x, methods that require x assume x = 1:length(y). Specify x data when y is not sorted or uniformly spaced. If x is not uniform and you do not specify method, lowess is used.If you specify a smoothing method that requires x to be sorted, the function automatically sorts the x data. Data to smooth, specified as a gpuArray column vector. Input data for the response data gpuarrayY, specified as a gpuArray column vector. If you do not provide gpuarrayX, methods that require gpuarrayX assume gpuarrayX = 1:length(y). Specify gpuarrayX data when the data are not uniformly spaced or sorted. If the gpuarrayX data is not uniform and you do not specify the smoothing method, 'lowess' is used. If you specify a smoothing method that requires gpuarrayX to be sorted, the function automatically sorts the gpuarrayX data. Smoothed data, returned as a column vector. Smoothed data, returned as a gpuArray column vector. 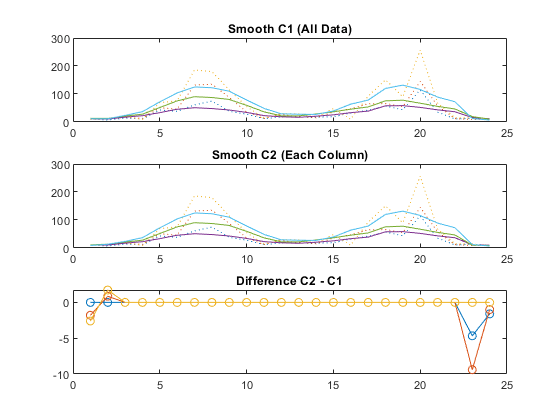 For more options for smoothing data, including the moving median and Gaussian methods, see smoothdata. You can generate a smooth fit to your data using a smoothing spline. For more information, see fit.